Holy Libido ~ Christian News Wire Release! SEATTLE, May 20, 2013 /Christian Newswire/ — It seems that books espousing intimate relationships are all the rage today. So how about a book that fans into flame our deepest desire for an intimate relationship with God? According to author Rod Smith, we were designed for a life of splendor, and we experience a hint of the original splendor as we allow the passionate Spirit of God to flow freely in our lives. 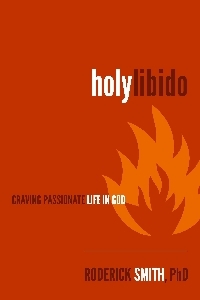 Throughout the pages of “Holy Libido”, readers will be amused one moment, and moved to tears the next by stories of both triumph and tragedy. They will be compelled to pursue an “all in” relationship with God as they learn about the importance of removing the spiritual debris that has accumulated over the years. Smith grew up as a country boy, and has always had a heart for adventure. And he has always enjoyed the “tension” questions about God’s plan for us while we’re here on earth. His life has been tempered with both deep trials and hard-fought victories, all of which have made him a man deeply in love with God. After obtaining a PhD from Purdue University, Dr. Smith became a marriage and family therapist. During his nearly twenty years as a therapist, he encountered many people who shared in the struggle to find a transparent and fulfilling relationship with God. Smith wrote the book he would like to have read years ago in the early days of his journey with God. It is a book that will serve as a guide for anyone who craves a life-transforming relationship with his or her heavenly Father. Only in an intimate relationship with God will one be able to live the life they were designed to live — a life with a bit of splendor. Watch the book trailer online! Click Here. Previous Was Adam a Wimp…in the Beginning? Next Holy Libido! Will You Pass it Around the Globe?